Fans of European power and progressive metal will recognize the name Niels Vejlyt, as he is the guitarist for Infinity Overture and Consortium Project. Mr. Vejlyt is is quite the virtuoso in the neo-classical tradition, and you will the echoes of the legends in his style on his first instrumental album Sthenic. As expected this album is a platform for Vejlyt to display his skills. As such, we need not quibble about the breadth and depth of his guitar handiwork. If you're player or simply a fan of electric guitar, you will likely salivate over Niels' impressive chops. Otherwise, Sthenic is just another album of lucid shredding from another fine guitarist. Nevertheless, and again not questioning his skill, the arrangements are rather bland and predictable, with a few exceptions. The first exception comes at the beginning with Heads Up, a song with a moderate pace and less shred pyrotechnics. Winter, the final cut, might be the most interesting. It begins with acoustic guitar, only to develop into a guitar clinic of impressive fret work over a neo-progressive arrangement. In between, From Die Today to My Little Rascal, you have metal shredding over a heavy to power metal arrangements, with Olympic shredding on that latter song. Kajsa offers electric solo over piano. At first it sounds intriguing, then later as if the piano and guitar are in conflict. 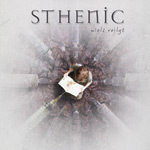 Sthenic seems a mixed affair in composition, but with one simple and sound characteristic: Niels Vejlyt's impressive and skillful guitar work. This an album especially crafted for guitar wonks everywhere.